Baldwin Pui and Hoi Ming Fung in their workshop in Central, Hong Kong. 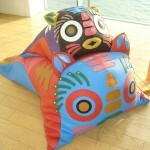 The 2 Tiger sofas Hoi Ming Fung and her partner Baldwin Pui created for Fendi’s “Fatto a Mano” project. 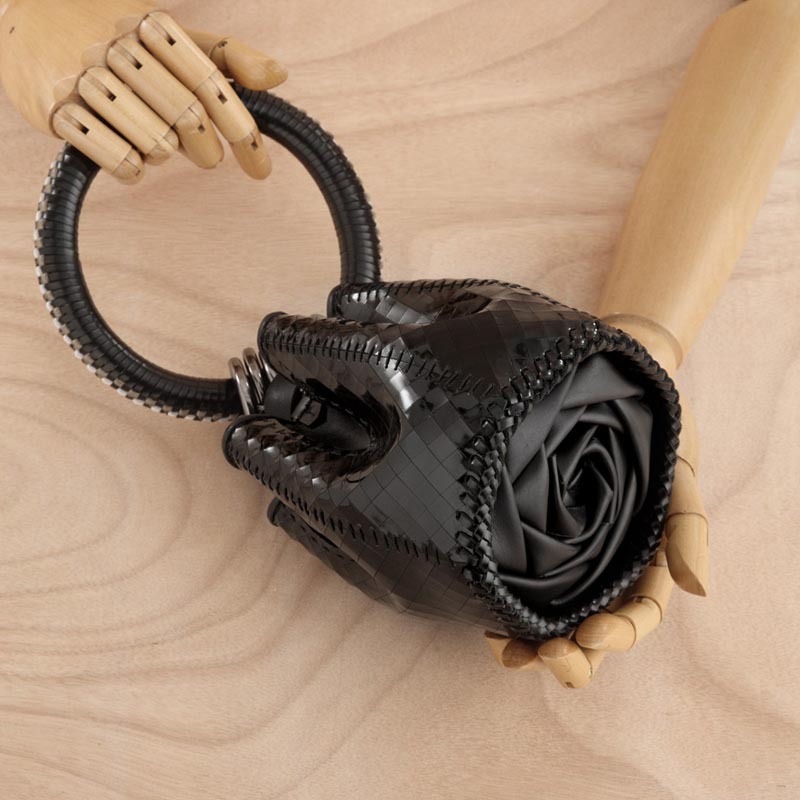 The Bud Ebony bag shaped like a rosebud was the first bag created by the pair Hoi Ming Fung and Baldwin Pui. 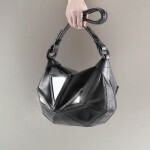 The Drawstring bat bag from Hoiming, another Nicely Made in China handbag. Hoi Ming Fung and Baldwin Pui, business and life partners, created “Hoiming” in 2007, making leather handbags, which are steadily growing in popularity and reputation in the world of fashion accessories. Nicely Made in China (NMiC) met them in their workshop in Hong Kong where they talked about their passion for leather and fashion. How did you two start Hoiming? At first we worked separately – after graduating Baldwin worked for a fashion company and I joined an ad agency. He loved experimenting with leather hide, and after a trip to Japan he came back laden with reference books and tools for working with leather. I was already making my own handbags at that stage, as I wanted something unique rather than a brand name like everybody else. Soon colleagues began to ask me to make some for them as well. In 2005 Baldwin won a Hong Kong young designer award. The prize was 6-months at the famous London school Central Saint Martins College of Art and Design. Shortly after that, we left our jobs and launched Hoiming. It’s not always easy to work as a couple. Who does what in Hoiming? We work on the design together. Hoi Ming takes care of the production of the bags and I manage the public relations side of our business. What type of leather do you use for your creations? We use cow hide from Italy and China, and actually, for our latest collection “Scar” we used pony leather. These are all quite easy to find at the leather market in Hong Kong. Our inspiration comes from our surroundings and from what’s happening in our lives. It also reflects our emotions. For the 2010 FW collection “Scar”, we resisted the trend elsewhere and instead decided to “remove” something from the classic handbag style, in our own mischievous way. Where do you make the bags? All our bags are handmade in a factory in China owned by a friend of ours. We’ve trained a small group of employees to make our bags just the way we want them. They’re all stitched by hand with waxed thread and produced in very small quantities – no more than 10 or 20 pieces usually. Handmade products are making a come back and big brands know it, as you can testify. Yes indeed. Fendi asked us to participate in their “Fatto a Mano” – handmade in Italian – workshop, which was held in the “Gallery by the Harbour” in Kowloon. 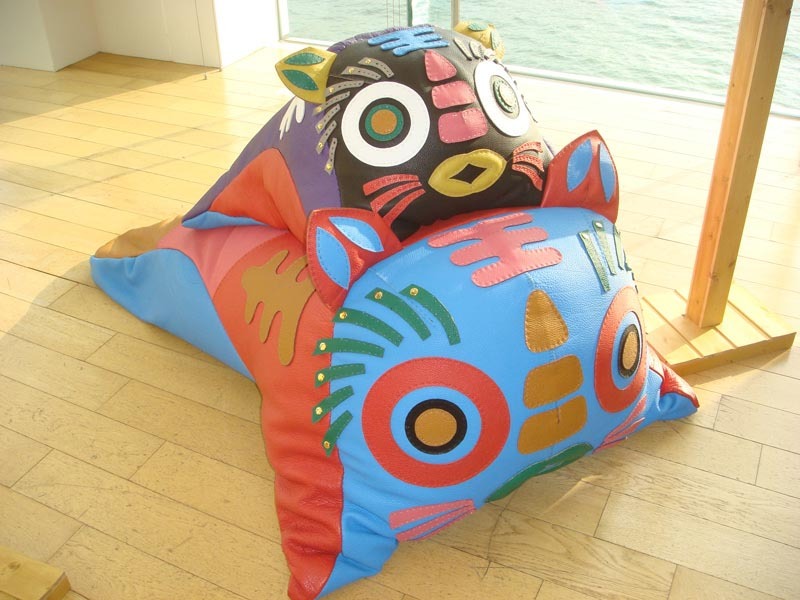 They asked us to make 2 sofas on a tiger theme (the “Tiger” sofas) and a lamp called Lion Dance. It was wonderful to collaborate with a well-established brand. We had the opportunity to work with their craftsmen and see their passion first hand. We also learned some handmade techniques we were not familiar with. Where can Nicely Made in China readers find your creations? At the moment, our distribution is confined to the Asia-Pacific region. We’re in Lane Crawford in Hong Kong. We’re also available in Singapore, New Zealand and soon to be in Zen at Central World in Bangkok.